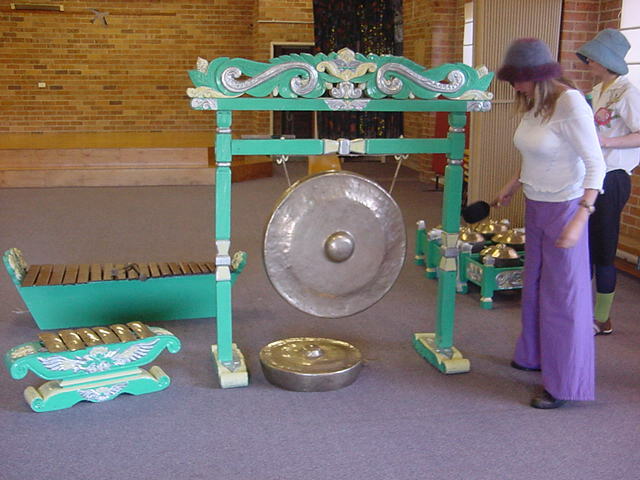 Finally the long-awaited day when the new Salendro Gamelan orchestra purchased by AIAA NSW North Coast Branch has arrived. The gamelan orchestra has been funded by a NSW Community Relations Commission Grant and auspiced by the Byron Bay Community Association. An amount of $2000 was granted by CRC on 31st March 2002. Friends in Bandung helped to seek out and purchase the gamelan in October 2002 while AIAA members in Byron Shire worked very hard organising concerts at Byron Bay High and Southern Cross School, Ballina, garage sales at Suffolk Park and Brunswick Heads, as well as fundraising at Byron Bay Market Charity of the Day in order to raise the rest of the money needed for transporting the gamelan from Bandung to Byron Bay. 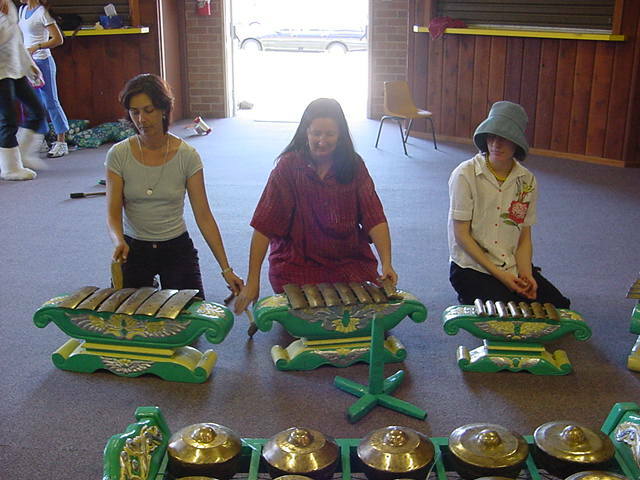 In May 2003 Judy Shelley from AIAA NSW North Coast Branch traveled to Bandung in West Java where the instruments were waiting to be transported. With the help of Oseng, Gun Gun and Acep, constructing boxes and packaging the instruments, Judy organized the transport and shipping of the instruments to Australia. The Salendro Gamelan finally arrived in Byron Bay on Thursday 21st August 2003 after over a week in customs and extra fumigation. Garuda airlines have supported the project by giving AIAA a discount on the transporting of the 285kg cargo. Artist Andrew Jack and ‘Art Collections’ donated $700 toward the transporting of the instruments from Bandung to Byron Bay. 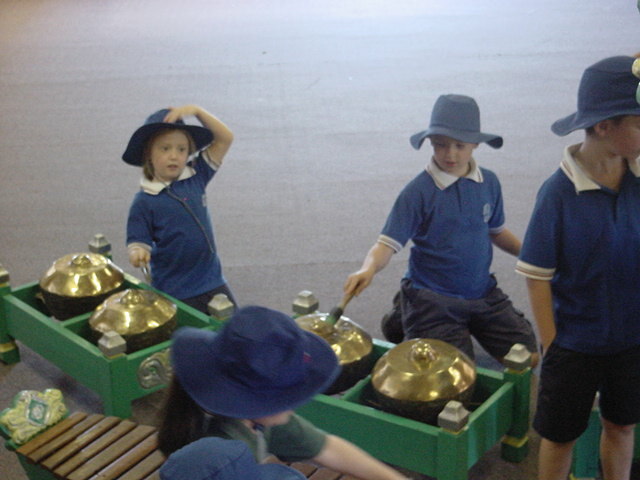 St Finbars Catholic School, Byron Bay have donated a storage space for the instruments. Import agent ‘Air, Sea International’ gave AIAA advice, assistance and saved the organization on some costs associated with the import. AIAA work for the dole participants volunteered their time to transport, unpack, set up and photograph gamelan orchestra. 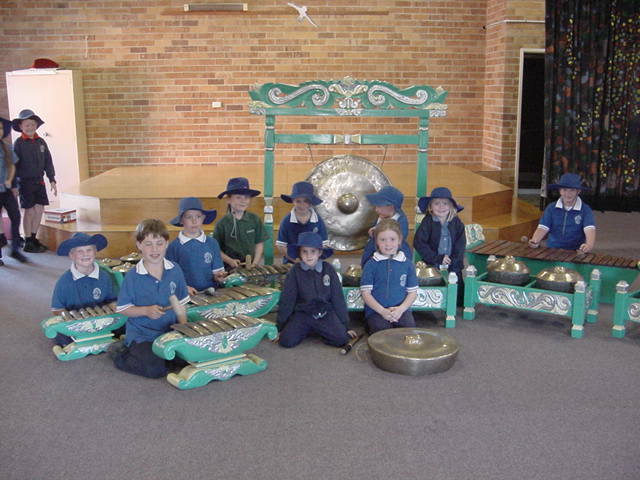 Now that the instruments are on the North Coast of NSW regular classes have started at St Finbars Primary School and a number of other schools are interested in taking up gamelan tuition. The enthusiasm of the St Finbars students was clear (see photos above) when they had the opportunity to have their first look and play of the instruments. Local Gamelan musician Carolina Stubbs has started off the classes and visiting musician Wahyu Roche from Bandung will soon be teaching interested students as an extra curricula activity. Gamelan Salendro lessons for the general public are planned to start in the near future. 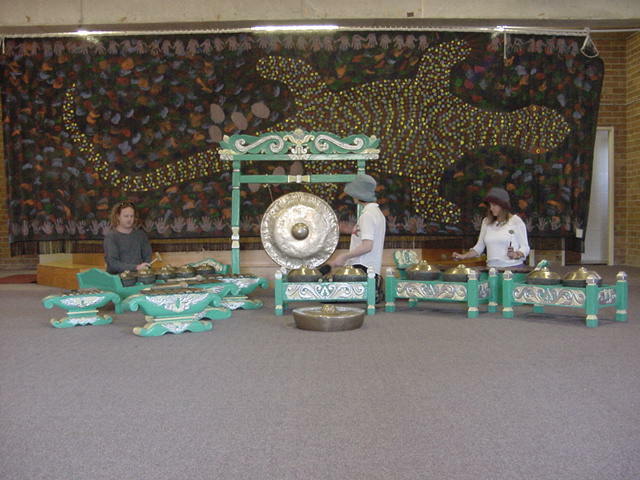 Now that the Australia Indonesia Arts Alliance NSW North Coast Branch have their own orchestra of gamelan salendro instruments this creates exciting opportunities for the whole community.